George “Red Buck” Weightman (18? ?-1896) – One of the most vicious outlaws in Oklahoma, Weightman was thought to have originally come from Texas and earned his nickname for his flaming red hair. By the time he wound up in Oklahoma he had become a horse thief and killer, reportedly having already killed four men and willing to kill more for the price of just $50. One of the most feared outlaws in Indian Territory, he was said to have enjoyed killing and often bragged about his deeds. In 1889, he was arrested by Heck Thomas for horse theft and sent to prison, but after serving three years, he was released and returned to Oklahoma where he soon hooked up with the Doolin Gang. On September 1, 1893, Red Buck was with the Doolin Gang in the Ingalls, Oklahoma gun battle, which took the lives of three U.S. Deputy Marshals. On one occasion, while Red Buck was riding with Bill Doolin and his gang, Red Buck allegedly tried to ambush and kill Bill Tilghman by shooting him in the back. 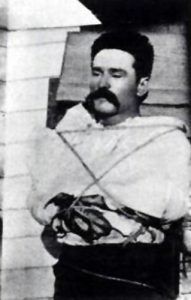 However, Doolin, who was said to have been a fair-minded man despite his outlaw ways, stopped Red Buck from killing the U.S. Deputy Marshal, stating that Tilghman was too good a man to be shot in the back. On April 3, 1895, he participated in the train robbery in Dover, Oklahoma with the Doolin Gang. The gang escaped, but a posse was immediately on their tail and when the lawmen caught up with the thieves, a gunfight broke out, in which “Tulsa Jack” Blake was killed. 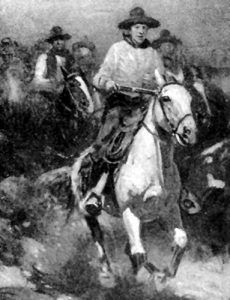 Red Buck’s horse was shot out from under him, but he vaulted up behind George “Bitter Creek” Newcomb and the outlaws finally outdistanced the posse. By that time, Red Buck was known by every U.S. Deputy Marshal in the territory and he sent an open challenge to the Marshals to just try to arrest him. However, few felt the reward was worth the chance of taking him in. After the Doolin Gang escaped from the Dover train robbery, they stopped at the home of a Baptist minister named Godfrey demanding a meal and planning to steal his horses. When Godfrey objected, Red Buck shot him to death. Doolin was so outraged at this unnecessary killing, that he kicked Red Buck out of the gang and then went into hiding from the vicious outlaw. In the meantime, Red Buck continued his murderous ways and was hired to kill a prominent rancher named Perry Parish in Greer County. However, the rancher found out about the imminent attack and was able to save himself. In September, 1895 rancher, Gus Holland, would not be so lucky. When Red Buck and a man named Charlie Smith tried to steal Holland’s cattle and the rancher objected, Weightman killed him. A few days later, the bandits tried to sell the cattle to a rancher in Cleo Springs, but when the rancher recognized Holland’s brand, he refused. That night, Red Buck tried to kill the rancher, who survived the attack, but took no further action in fear of his life. Red Buck then rounded up a new gang of outlaws, mostly men from Texas, who began to terrorize the Taloga area. His gang included an ex-lawman from Motley, Texas named Joe Beckman, who left the state under charges of murder and extortion, as well as other men named Hills Loftis and Elmer “Kid” Lewis. However, also living in the area was U.S. Deputy Marshal Joe Ventioner, who was determined to rid the region of its lawless elements. Red Buck and his gang made several attempts on Ventioner’s and other lawmens’ lives, but were unsuccessful. When the gang robbed a store in Arapaho, Oklahoma, 30 miles south of Taloga, the gang was quickly pursued by U.S. Deputy Marshal Joe Ventioner and his posse. However, when the gang fled to Texas, they were out of jurisdiction, and the Texas Rangers were summoned to confront them. In skirmishes with the Rangers, Joe Beckman was killed and Red Buck was seriously wounded, but was able to escape. Elmer “Kid” Lewis and Hills Loftis were also able to escape. Lewis was later lynched in Wichita Falls, Texas after robbing a bank and killing a banker. Loftis was never heard from again. Red Buck returned to Oklahoma, where he was nursed back to health and soon joined forces with another Texas outlaw named George Miller. At one point, a citizen named W.W. Glover, who lived in a dugout near Arapaho, harbored the fugitives, but after a couple of days, decided he would rather collect the rewards on their heads. After informing the Indian Police in Arapaho of their location, Glover led a posse to the pair’s hideout. However, Red Buck shot and killed him and the two escaped. When U.S. Deputy Marshal Joe Ventioner heard that Red Buck was back in the area, he, along with Deputy Marshals William Holcomb and Bill Quillen began to trail the outlaws again. Pursuing them to Custer County, they found that the men were hiding out at a farm owned by Dolph Pickelseimer, who had a history of befriending outlaws. On the morning of March 4, 1896, when the marshals tried to arrest the men, gunfire erupted and Red Buck was killed by Joe Ventioner. Retaliating, George Miller shot Ventioner in the abdomen. Holcomb then fired at Miller, striking his cartridge belt and causing several rounds to detonate, blowing off his right hand at the wrist and the three middle fingers of his left hand. Pickelseimer was arrested and charged with harboring fugitives and George Miller was sent to prison in Texas where he served a short sentence. Weightman was buried in the Arapaho Cemetery in Arapaho, Oklahoma. After Miller’s release he had his useless hand fitted with a steel hook, which earned him the nickname “Hookie Miller.” He continued a life of crime for several years before finally converting to the other side and becoming a U.S. Deputy Marshal himself. He was later killed while serving an arrest warrant. In the meantime, U.S. Deputy Marshal Joe Ventioner recovered from his wounds and continued his life as a lawman.